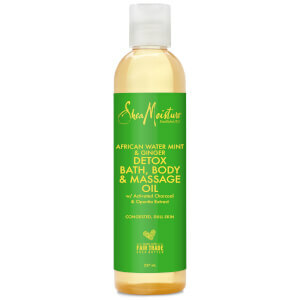 Restore a healthy glow to skin with Shea Moisture Fruit Fusion Energizing Bath, Body & Massage Oil. Shea Butter and Coconut Oil work in harmony to create an ultra-hydrating blend; replenishing high levels of moisture deep below the skin surface for a brighter, more even-looking tone. Imbe Oil helps to protect against the damaging and ageing effects of external aggressors to leave skin reenergised, nourished and infused with a luminous radiance. A fruity fragrance of Green Apple and Lychee Berry stimulates the senses. Pour into a warm bath to create a fragrant spa bath. Gently rub into skin after shower or bath to restore moisture and provide the ultimate protection. Warm gently in hands to use as a therapeutic massage oil. Helianthus Annuus (Sunflower) Seed Oil, Prunus Armeniaca (Apricot) Kernel Oil, Prunus Amygdalus Dulcis (Sweet Almond) Oil, Simmondsia Chinensis (Jojoba) Seed Oil, Fragrance (Essential Oil Blend), Butyrospermum Parkii (Shea) Butter*, Tocopheryl Acetate, Cocos Nucifera (Coconut) Oil, Olea Europaea (Olive) Fruit Oil, Cocos Nucifera (Coconut) Fruit Juice, Pyrus Malus (Apple) Fruit Extract, Hylocereus Undatus (Dragon) Fruit Extract, Garcinia Livingstonei (African Mangosteen) Seed Oil, Litchi Chinensis (Lychee) Fruit Extract.